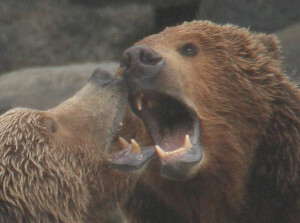 Brown bear mating pair "kissing"
Primary Activity: Wait for the rain to let up. While cruising in Alaska, I make sure to visit a favorite bear area on the Alaska peninsula. This particular location has a sheltered bay next to a beach that supports clam growth. The sheltered bay means I can take pictures from a steady platform — my boat — without going ashore and being eaten by my subjects. The fact that the beach supports clam growth means the bears have a reason to visit when the tide goes out — they can feast on clams while I take pictures. It's a long-standing principle among indigenous Alaskans that there are two worlds — the bear world and the human world. The bear and human worlds are separate, and anyone who tries to mix them together risks being eaten. I respect this principle, for a number of reasons including not wanting to be torn to pieces by a hungry bear. Also, when I visit the bear world, if I anchor my boat away from shore and try to avoid making too much noise, so the bears quickly forget I'm in their neighborhood — they act naturally, just as though I was invisible. This means I can quietly set up a long telephoto lens and photograph the bears acting naturally. Over the years I've seen many incredible things in the land of the bears — bears fighting in earnest over females, trying to tear each other apart. But also bears play-fighting, and sometimes showing a level of tenderness one doesn't expect to see in animals that sometimes weigh over 1000 pounds, in a natural setting where survival requires occasional ferocity. I also occasionally see bears making love. I'm somewhat reluctant to address this subject in a human society that makes far too much of sexuality, turns it into a consumer product, but because it's part of the bear world, I guess it deserves to be mentioned. As to my describing it as "making love", isn't that bending over backwards to use human terms for crude animal behavior? Not always — this year I saw an interaction between bears that justified those words. Look closely at the male bear in the pictures below and you will see that he has a large patch of fur torn from his left side and hanging free (most easily seen in images 15 and 20). This is a common sight during bear mating season — male bears get into fights with other males, sometimes to the point of injury or death. I had originally intended to individually caption the pictures shown below, but I soon realized that produced too much gratuitous detail as well as relying on guesswork. Readers will have to figure out what's happening on their own. The broad outline is that the female becomes annoyed and rejects the male's amorous overtures, then they cool off and come to an understanding. In the last frame, the male does something I've never seen a bear do — he covers his eyes in what I interpret as frustration. I know we're not supposed to apply human feelings to animals (something called anthropomorphism), but for the final picture, I find the impulse somewhat irresistible. NOTE: On newer browsers, this viewer supports mouse (desktop) and touch (mobile device) gestures to change images.